Indian cuisine enjoys a great reputation among all ethnic foods in the world. It has an uncanny charm and those who try it find it rich in taste and flavor. A common ingredient in the Indian food is a wide range of spices. The secret of Indian cuisine is in proper use of selected spices to bring out rich flavor, aroma and character in food. By proper use of different techniques such as roasting or frying the spices whole, or grinding them to make a paste, it is possible to draw different flavors from the same spice. The popular belief that the Indian food is generally hot is not correct. By correct use of spices and ingredients, the food can be prepared to suit one’s taste. 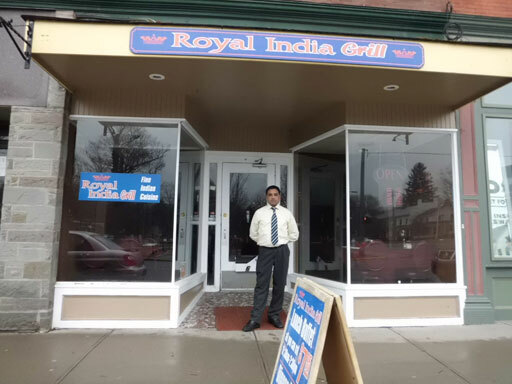 Royal India Grill Cuisine is prepared fresh, paying careful attention to our patron’s choice of mild, medium or hot flavor. We do not use packaged curry powders or canned meat, seafood or vegetables. Every dish at Royal India Grill is prepared according to original recipes, which have become part of Indian culture over thousands of years. We are confident that your dining experience at Royal India Grill will be a pleasant one!